The long wait is finally over – the DJI Smart Controller for the Mavic 2 series has just been announced. If you are one of the many enthusiasts who cannot wait to get their hands on this beaut, then you have to the right place. Here is a quick look at it! 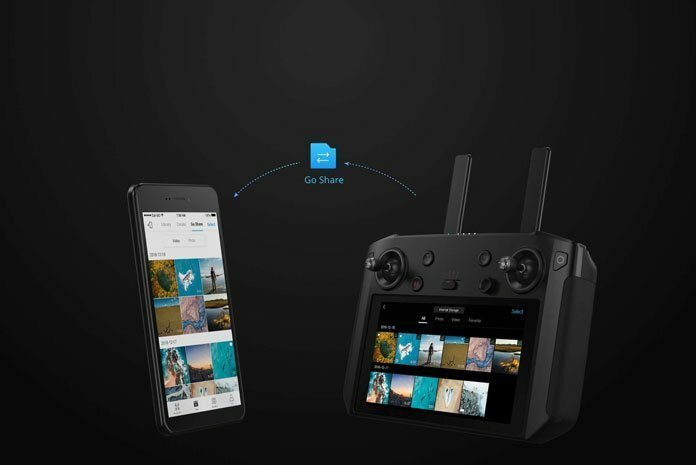 Why The DJI Smart Controller Exists? There is a huge reason why DJI decided to create the Smart Controller. Basically, it is all about taking the independency on having to utilize either a smartphone or tablet just to fly drones. The company also plans to eliminate the need to use various components, such as cables, mounting system, monitor, and a remote controller, just to name a few. The concept behind the DJI Smart Controller is pretty straightforward: it wants to incorporate multiple components into what is a single, better self-contained device. Of course, not everyone may like the idea of a centralized component. But really, why should you spend more money on this controller when you already have a smartphone and controller? Interestingly, the aforementioned is a valid point and there are factors to consider when talking about this argument. It holds true that almost everyone across the world uses smartphone or tablet these days. Hence, it only makes total sense for you to use one with a quadcopter. But there is a catch: Your smartphone tends to drain its batter down, especially when being used every now and then. Think about going outdoors and flying your drone using your device, but suddenly the battery wears down and you have no way of charging it. This is where a stand-alone remote controller – one that comes with a specially-incorporated screen – comes into play. You no longer have to rely on your mobile device. As promised, the DJI Smart Controller comes with lots of interesting features, making it an interesting one to invest on. For starters, it comes with a 5.5” screen that is built directly into the controller itself. This has been designed in such a way in order for enthusiasts like you to no longer be burdened with the idea of connecting to a smartphone. As such, the entire process of flying your drone becomes much quicker and easier. 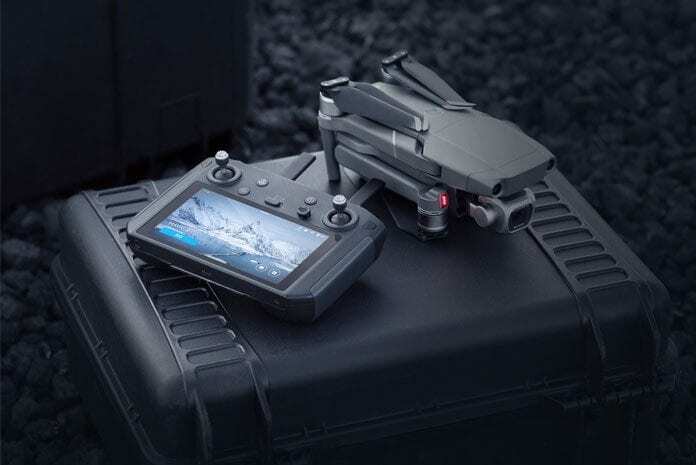 Interestingly, the controller can be paired with DJI’s newest quadcopters, which include the likes of the Mavic 2 Zoom and the Mavic 2 Pro. 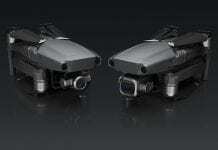 The latter, in particular, is known for using the sophisticated OcuSync 2.0 video transmission system. 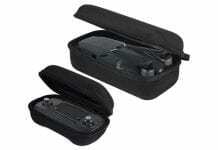 In addition, the Smart Controller is capable of supporting automatic switching between 2.4 GHz and 5.8 GHz. As a result, the apparent influence of interference from the environment particularly on image quality and drone operation is greatly reduced. This capability also makes it possible for you to achieve a more reliable long-range transmission of up to a reported distance of about 8 km. The DJI Smart Controller offers an ultra-bright display, which boasts an output of around 1000 cd/m2. In case you did not know, this figure is twice the brightness when compared to most standard mobile devices nowadays. DJI has also optimized this feature to be used in direct sunlight. Moreover, you have the ability to adjust the brightness either automatically or manually. Let’s say the Auto is enabled. The controller will start adjusting the brightness in an automatic manner, a process that is achieved through a built-in light sensor. Thanks to it, the process becomes more optimal for the human eye and is according to your surrounding environment. Note: If you go to the settings menu, you have the freedom to choose just how the screen behaves according to the exact conditions you are flying in. Another fun flying option is the DJI Goggles which provide a first person point of view at high resolution. Mind you, the DJI Smart Controller has with very exceptional build quality. Not only does it feel very robust, but it also has some added weight to it. The latter, in particular, is quite beneficial. It simply gives you a sense that you seem to be operating something massive. You would find yourself becoming more immense, as you tend to pay more attention to what you are doing than using a conventional remote controller. The Smart Controller has a weight of about 690g. Let’s say you are using the standard Mavic 2 Pro remote controller that comes with a weight of 320g. Now add its weight to, say, Apple iPhone 7+’s and you will easily get a total weight of 510g. In comparison, the DJI Smart Controller does not necessarily weigh much more. One of the things you will notice on standard controllers is that they do not have an HDMI out port. But this is not the case with the all-new DJI Smart Controller. It can play video via the said port at about 4k 60fps and, more importantly, can offer you a live output straight to a secondary screen. As you can see, this is a very advantageous feature, especially for professionals like directors who want to directly see what they are shooting. With the HDMI port, it is easy for you to connect to a monitor and look at the screen without having to be bothered. You can even tweak the HDMI settings according to your preference in the Quick Settings menu. From there, you can change the output mode, HDMI resolution, rotation, and screen zoom. The DJI Smart Controller is specifically built to give you around 2 to 2.5 hours of battery life. 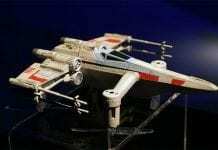 Plus, it has the ability to be operated in adverse temperatures. Basically, the controller utilizes two built-in Li-ion batters, both of which are 2500 mAh, and takes about an hour to be fully charged. But despite being a built-in battery, it is possible to simultaneously charge and use the controller if you choose to connect it directly to a USB power supply. It is worth noting that the built-in battery may not easily be a favorite. It would have been more interesting if DJI decided to introduce a battery plate, allowing users to use an external or internal battery. The thing about the DJI Smart Controller – and what makes it worth investing for – is the features it offers. In fact, as soon as you use this controller, you will probably have a hard time going back to the regular ones. Sure, you might think it is a bit overpriced (costs around $649), but it is justifiable especially if you are a working professional. At the end of the day, the DJI Smart Controller is able to meet expectations.